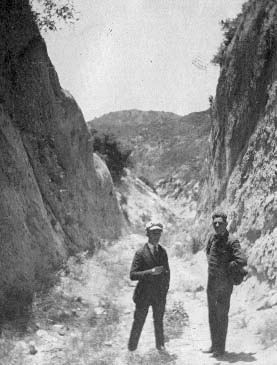 Movie men Phil Lang (left) and Storm V. Boyd at Beale's Cut, looking south, possibly as early as 1907, when Kalem Co. was founded, but more likely five years later. Original caption: "Old stage coach road and its cut through the mountains  a site of many a hold-up." According to contributor Tanner Manceaux, Boyd, Lang and Paul Hurst ("The Ox-Bow Incident," 1943) "traveled from New York, California and Jacksonville, (writing) screenplays, acting, directing and staring in Kalem's films in the very early 1900s." Kalem Co. was a pioneer film company that turned out about 300 titles per year from 1907 to 1917. According to Manceaux, its biggest money maker was comedian Lloyd Hamilton of "Ham & Bud." Boyd, born in Watertown, New York (date unk.) was the assistant director on 28 of those titles in 1912-13 and acted in one, "The Grim Tale of War" (1913). Lang, born c. 1886 in Xenia, Ohio, wrote four screenplays from 1914-19. Both Boyd and Lang died in 1919  Lang on Jan. 24 in New York City; Boyd on Oct. 13 in Syracuse, New York.